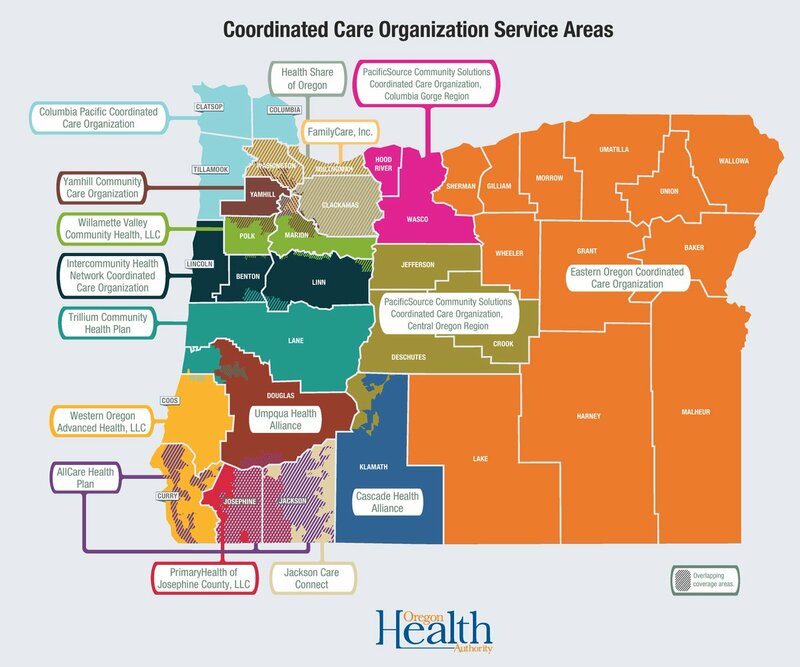 Current service areas for Oregon's coordinated care organizations. Health Share, with 315,000 members across the Portland Metro area, said Tuesday it will submit a letter of intent for a contract to the Oregon Health Authority for the 2020 to 2024 round. “Health Share has been serving the Oregon Health Plan population in Clackamas, Multnomah, and Washington counties since 2012 and looks forward to continuing to partner with communities to achieve ongoing transformation, health equity, lower cost and the best possible health for each individual,” the statement said. “Health Share’s Board members are proud of the work we have done together over the last six years and hope to be granted the opportunity to continue with the important work of CCO 2.0,” said Marni Kuyl, chair of Health Share’s board. The move follows a vote by Health Share's board to pursue another contract. There had been speculation in recent months that Health Share would break up following the resignation of Janet Meyer as CEO in September or that it could face competition from within its ranks. But the statement said that Health Share’s 11 partners -- Adventist Health, CareOregon, Central City Concern, Clackamas County, Kaiser Permanente, Legacy Health, Multnomah County, Oregon Health & Science University, Providence Health & Services, Tuality Healthcare and Washington County -- would like the Oregon Health Authority to award Health Share the Medicaid contract for the Portland metro area. It added that they might also submit letters of intent for a contract to ensure they remain in the Oregon Health Plan system. “We believe that the Oregon Health Authority's best option to ensure the continued access to, and coordination of services for, Oregon Health Plan members in Clackamas, Multnomah and Washington counties would be to continue to contract with the CCO operating in that service area -- Health Share of Oregon,” said Kuyl. Oregon’s Medicaid budget was $6.4 billion last year, with $5 billion from the federal government. Health Share has the biggest slice of that pie. Health Share’s chief medical officer, Maggie Bennington-Davis, is currently leading the organization on an interim basis. The board of directors established a search committee when Meyer stepped down but it has not actively been looking for her replacement, said Stephanie Vandehey, Health Share’s spokeswoman. The group wanted to wait until the Oregon Health Authority released its requirements for the next five year-round, Vandehey said. “Now that we’re able to dig into the (contract bid), that group can refocus on the type of leader Health Share will need moving forward,” Vandehey told The Lund Report in an email. Coordinated care organizations receive money from the Oregon Health Authority to provide health and dental care to Medicaid recipients. The set up in the Portland area is unique because Health Share is essentially a pass-through organization that contracts with its partners to provide care. It currently offers four physical health plans, five dental plans, with the counties taking charge of mental health care. The letters are due Friday by 5 p.m. Earlier this month, the health authority released its requirements for the next round of funding. They include an emphasis on behavioral health; focusing on so-called social determinants of health like housing and food, and equity; and a new approach to bonus payments designed to encourage better outcomes.